Blog home»How much water is used to make a pound of beef? How much water is used to make a pound of beef? Yes, it takes water to produce beef, but in the 2.5 million years since our ancestors started eating meat, we haven’t lost a drop yet. Based on the most recent science and extensive calculations of a wide range of factors, it is estimated that the pasture-to-plate journey of this important protein source requires about 1,910 US gallons per pound (or 15,944 litres per kilogram) of water to get Canadian beef to the dinner table. That’s what is known as the “water footprint” of beef production. Make no mistake – it does take more water to produce a pound of uncooked, boneless beef (over 1,800 gallons/6814 liters) than to produce a pound of dry peas (178 gallons/674 liters), dry beans (488 gallons/1847 liters) or dry lentils (577 gallons/2184 liters), or any other protein crop, but this is only one of many pieces of information to consider. The pastures and feed crops that beef cattle eat account for nearly all (99%) of the water used in beef production. Garret Hill, Duval, SK. Photo courtesy of the Saskatchewan Cattlemen’s Association. Garret Hill couldn’t figure out what was wrong. Cattle had plenty of grass, clean water, a standard mineral mix in front of them, they appeared to be in good condition, yet conception rates among cows and heifers on his family’s central Saskatchewan ranch were declining. This problem came to a head about six years ago. Their area around Duval, about an hour north of Regina, had experienced a succession of particularly wet growing seasons. There was plenty of grass and a relatively deep (150 foot) well on the farm supplied water to the herd as needed during the year. A water source that is safe, palatable, and readily available is essential for animal survival, but there is also clear evidence that the accessibility of water impacts the productivity of cattle. Dugouts are a common water source for range cattle in western Canada. When dugout water is pumped into troughs, pre-weaned calves gain more weight. April 22nd is Earth Day. Earth Day is recognized globally by people from all walks of life as a way to foster environmental respect and celebrate conservation. 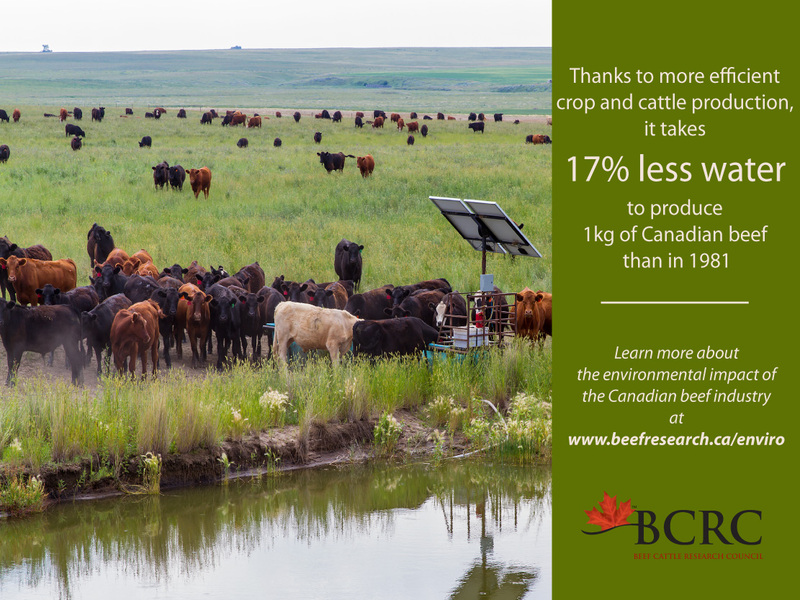 Cattle producers across Canada chose to make their living as stewards of the land and certainly appreciate and depend on a healthy environment. Earth Day is an excellent time for all of us in the industry to celebrate environmental achievements, and cultivate discussion about further advancement. Let’s ask questions, seek answers and talk about how we can make continual improvements related to greenhouse gas and manure management, carbon sequestration, biodiversity, nutrient cycling and more. Water conservation is a hot topic. As concerns rise about depletion of water resources both locally and globally, livestock production and other agriculture sectors are often criticized for water use. What can the Canadian beef industry do to conserve water? This article written by Dr. Reynold Bergen, BCRC Science Director, originally appeared in the April 2017 issue of Canadian Cattlemen magazine and is reprinted on the BCRC Blog with permission of the publisher. Imagine a scene from an old spaghetti western, where two ranches are battling for control over the only waterhole around. The hired guns squint at each other from behind the sagebrush, waiting for the chance to unleash a hail of bullets at their foe, until the Texas Rangers ride in to restore peace.